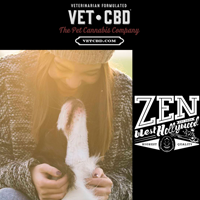 Posted November 11th, 2017 / filed under Zen West Hollywood VetCBD, Zen West Hollywood. It’s being hailed as a new way to help your favorite furry friend: marijuana has become an increasingly popular way to treat arthritis, cancer and anxiety in pets. NBC’s Jo Ling Kent reports for TODAY on the controversial topic.